Pakistan Test and ODI captain Misbah-ul-Haq has called on his team to stop blaming losses entirely on the captain since cricket is a team sport. Ul-Haq stated that if Pakistan were to lose a match, every member of the team should take equal blame and see what areas they can improve upon before the next match. 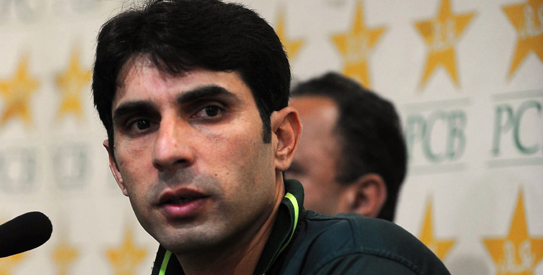 “One thing should be clear that the captain alone is not responsible for a defeat or victory,” ul-Haq said. Ul-Haq’s comments come after newly appointed Twenty20 skipper Mohammad Hafeez came under harsh criticism for failing to bring the best out of his death bowlers and top order batsmen throughout the course of the International Cricket Council (ICC) World Twenty20. Ul-Haq also noted that every member of the side should concentrate on showcasing their best in every match and not put all the blame on one individual if he fails to perform. “One individual’s bad performance or mistake should not be singled out, the entire team must be focused upon,” he added. Ul-Haq himself has been on the receiving end of some scathing criticisms after losing the past two ODI series against Australia and Sri Lanka. “When the team wins it gets the credit and this should also be the case when we lose a match,” ul-Haq declared. Ul-Haq is no longer in Pakistan’s Twenty20 side after he was stripped of the captaincy and removed from the team by the Pakistan Cricket Board (PCB) earlier this year. He also stated that Pakistan’s specialist spinners should be able to benefit from the pitch conditions in Sri Lanka throughout the World Twenty20. Instead of criticising each other after losing a match during the Twenty20 tournament, ul-Haq called on his team-mates to learn from their mistakes and stay positive. “In cricket we need to learn from any situation as we have quality players in batting and bowling. It is all in the mind and nothing else,” he said. This entry was posted in Uncategorized and tagged Australia, benefit, best, blaming, Captaincy, concentrate, conditions, cricket, death bowlers, equal blame, failing, harsh criticisms, ICC World Twenty20, improve, learn from mistakes, Misbah ul-Haq, Mohammad Hafeez, Pakistan, PCB, positive, scathing criticisms, showcasing, spinners, Sri Lanka, stripped, team sport, top order batsmen. Bookmark the permalink.